1. Who is out Champion? Warrior of Mars vs. Lord of Asgard for All the Marbles! The winner of this match is the Champion of the Tournament of Heroes Unlimited Class (finally!). Voting continues until Tuesday, June 20th at midnight EDT. This whole tournament I've been voting for characters I like, rather than who I thought would actually win. Not gonna change now. This whole tournament I've been voting for characters I like, rather than who I thought would actually win. 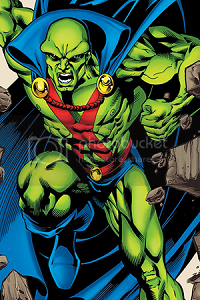 J'onn is great, but he's no All-Father. It would be a fluke (of the dice) if he won. J'onn is powerful, but he just isn't in the same class as Odin. I'm afraid this is a bit of a non-event. Folks I we really going to let an NPC win ? C'mon ! and if that don't sway you are you really going t let Marvel sneak a victory over DC at the last ? 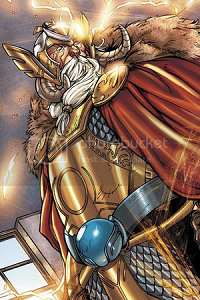 Odin, the All-Father and Lord of Asgard, is the Unlimited Class Champion in the Tournament of Heroes!